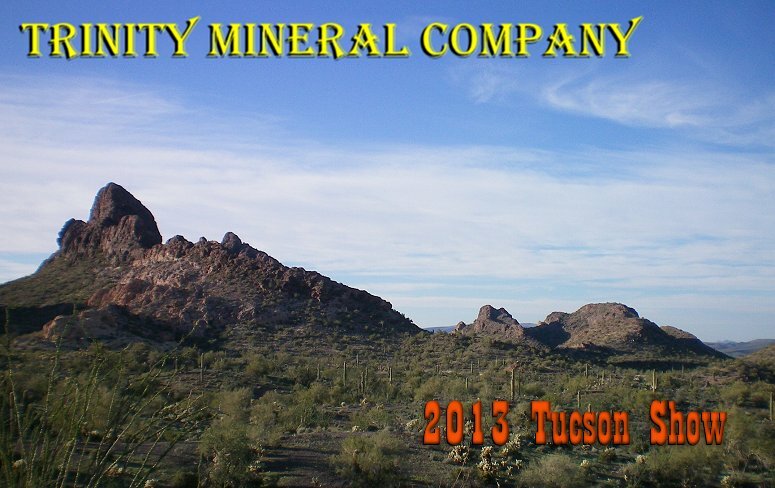 Welcome to the 2013 Tucson Show edition of the MineralShows.Com. The online show will start with a small selection of specimens from the Dr. Joan Massague Collection. That will be about January 13th. The first of four auctions will start on January 27th. New specimens will start to be posted around the first of February and online reports will start around then too. I have obtained the entire inventory of retired mineral dealer Carter Rich. Carter was a fixture at the Denver, Tucson and East Coast Shows for many, many years. I am pleased to debut the first wave of specimens at an open house show on February 4th and 5th at my Tucson rental. Steve Perry and I will also be offering hundreds of new specimens of benitoite and neptunite from the Benitoite Gem Mine. Last and by far not least California vinter Brett Keller will pouring wines from his private reserve of Mineral Wines. These are California Gold medal winners and fabulous!